Congratulations to Imagine’s Dr Rob Gorkin for winning “Best Pitch” at the Land Forces 2018 Innovation Pitchfest for his talk on “Smart Monitoring of Ballistic Armour using Graphene”. Land Forces is the Army equipment, services and technology exposition for Australia and the Asia-Indo-Pacific. Imagine is a member of the Horizon Defence Systems Alliance, a cross-industry agreement to contest government supply contracts. For more details on the innovation pitchfest, click the image below. 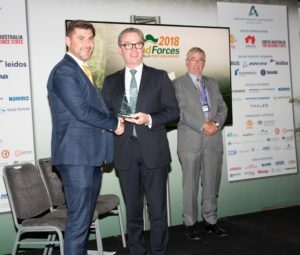 Dr Rob Gorkin (left) recieving the Best Pitch award from the Australian Minister for Defence, the Hon. Christopher Pyne MP (centre).